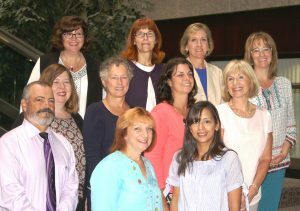 Pictured (l-r): 1st row – Ken King RN, Diane Hannify-Broughton RN and Ruth Mateo RN; 2nd row – Sandra Pajarillaga LICSW, Deirdre Putnam LICSW, Amy Gibbs RN and Patty Drozdowicz RN; 3rd row – Karen Richard RN, Cheryl Clocher, Sharon Gard RN and Susan Wamboldt RN. Not pictured: Betsy Bradford Boccuzzi RN, Karen Keveny, RN and Jean St. Peter RN. The Northeast PHO (NEPHO) Care Management Team is proud to be working closely with our NEPHO providers to assist them and our patients with care coordination in order to improve quality and efficiency. The team provides case management outreach and support to the NEPHO high risk population under our Medicare ACO and commercial payor contracts. NEPHO has a wealth of experienced professionals who interact within an integrated team model to better serve patients along the continuum of care. Our team provides transitional care, complex case management, disease management education, self-management education and community social service support to better serve our NEPHO providers, patients and families. Our team consists of: Certified Nurse Care Managers, Licensed Independent Clinical Social Workers, a Patient Engagement Coordinator and our Care Management Assistant. We are also assisted with Medication Therapy Management (MTM) by the NEPHO Manager of Pharmacy Services, Carol Freedman and her team. Contact our NEPHO Care Managers by calling the CMA Line at 978-236-1772 or see below to contact a specific colleague.